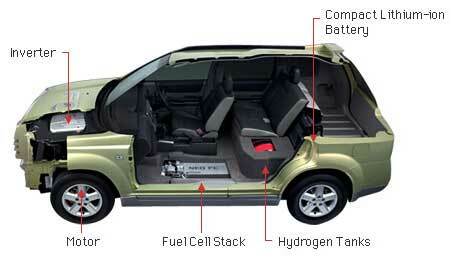 Nissan X-Trail FCV runs on a hydrogen fuel cell. Hydrogen cells would potentially have a number of advantages over Electric cars, such as range and ease of refueling. Electric plug in cars usually have a range of around 100 miles driving and a larger battery makes recharge times much longer. Nissan are looking at a date of 2015 for commercialisation, with many more hydrogen vehicles and refueling stations.